There’s a metroid in Donkey Kong Country: Tropical Freeze and someone finally found it. The search took four years, but it turns out it’s actually not that hard to find once you know where to look. Players have long suspected there might be more Metroid-themed easter eggs hiding out in Tropical Freeze after seeing Samus’ gunship hanging out in the background of the game’s 1-B Busted Bayou level when the game was first released on Wii U in 2014. Their faith got rewardedyesterday when player Shane Marchis shared footage on Twitter of a Metroid swimming in the background of a later level. So why did it take so long to find? The metroid appears in level 4-3, Amiss Abyss, in the Sea Breeze Cove world, but it’s not in any secret location. Instead, it will only appear if you backtrack to an earlier part of the level. Right after hitting the halfway point, there’s a section of the level filled with glowing jellyfish in the background and a mechanism Donkey Kong has to trigger in order to clear a path forward through some electrical seaweed. After passing through this part and getting outside the following tunnel, you can then swim backwards to the mechanism again by taking damage and passing through the sea weed while invincible. Once you’re back on the other side, wait a few moments, and eventually you’ll see a metroid swimming from the bottom of the screen up toward the top. The video above shows the easter egg in the Switch port, but GameXplain and others have confirmed the secret also existed in the Wii U version all along. The metroid only appears briefly, but alongside Samus’ gunship, it’s good fodder for fun fan theories about links between Tropical Freeze’s world and the rest of the Metroid universe. The callback makes sense given that Retro Studios, the company behind Tropical Freeze, also made the Metroid Prime trilogy. Some fans even took the original discovery of the gunship easter egg as potential evidence that Retro was working on a new Metroid game. Four years later, we now know that Metroid Prime 4 is in development, although Retro isn’t working on it. 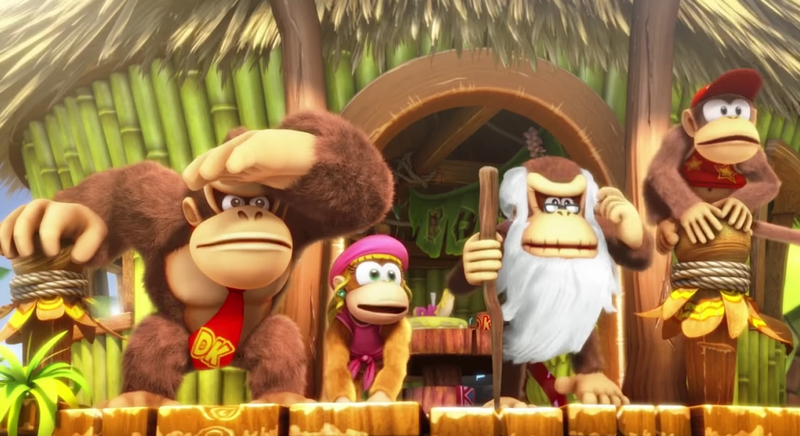 Tropical Freeze is chock full of other interesting secrets as well, including a fun easter egg in which Donkey Kong actually whips out a 3DS to play other Nintendo games, such as Donkey Kong Country Returns. Given that the game includes that level of fourth wall-breaking mindfuck, there’s no telling what other stuff might still be hiding in Tropical Freeze. Maybe in another four years, players will find Samus herself.